I’ve assembled a few Telecasters but up until now I have not assembled a Stratocaster and so I thought I would change that. The Strat I will assemble will have two single coils and a trembucker and some non-standard electronics. I stumbled across this interesting option that Emerson offers in their pre-wired Strat kits and that is to use one of the two Strat tone controls instead as a blender knob, blending pickups together. This seemed like a very interesting idea so I decided to see if I could derive the wiring for this mod before ordering the Emerson kit. I like the Emerson pre-wired kits because their soldering is sooooo top notch but I also want to understand the electronics I install so I spent some time today trying to design a wiring scheme to do what Emerson described. I’ve done some wiring design before, here and here, and since guitar electronics are pretty simple, they’ve always worked so I expect this one will also. Below is the wiring diagram with which I ended up. The five position switch is shown along with the poles of the switch that are connected when the switch is in each position. Using these positions, the pickups can be mixed and matched in interesting ways. For example, in one position (marked position #1 in the diagram) the Bridge pickup is selected (the Seymour Duncan Trembucker) and the single coil neck pickup is blended in, the amount of neck pickup contribution being controlled by the second tone knob (marked “blend” on the paper). 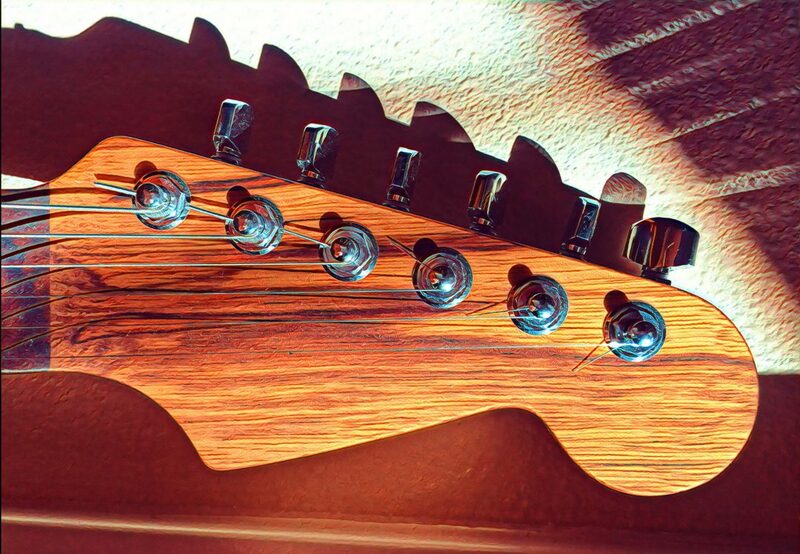 In position #4, as another example, the neck and middle single coils are combined with the bridge trembucker, which is blended in. How will this sound? Who knows but it seems like it might be pretty cool.